On a visit to camp in early January, the temperature locked below 20 degrees in the first true freeze of the off-season, it seemed (okay, felt) like the kind of day to spend in the Admin office organizing the archives. The excerpt below, from the February 1974 issue of the camper newsletter, written by my father—Irwin “Flick” Fleischner, speaks to the ongoing power of the Scatico experience—both connections to the land and, more importantly, friends and community. And yes, it did provide the motivation to bundle up for a walk around camp. I couldn’t resist re-printing…. There is a legend in Greek mythology that whenever Achilles found himself hard-pressed in battle he would touch earth, regain strength and spirit, and win the day. There are any number of practical applications of the legend; the idea of a vacation to “recharge batteries,” the pilgrimage to holy places, the need to rethink and reaffirm goals and values—all variations of the theme. Camp directors have their own way of “recharging.” We come back in the fall somewhat drained from the excitement of the summer, reacting to the abnormal quiet, to the change from the total involvement of camp life. But the winter, far from the period of hibernation which nature decrees for most of its creatures, is one of intense activity and planning. How do we get up for it? First, the pilgrimage. I drove up to camp on a bright Saturday in January. The snow had melted sufficiently to permit walking around the grounds, but there was a smooth white blanket over the lake, fields, and court, and the eaves of the buildings were crystal as water dropped from huge icicles. Out of a cloudless sky the brilliant sun bounced off the white buildings and provided almost a visible warmth. A two-hour walk left one at peace with the world, awestruck at the beauty of the camp, and wishing that the day could be shared by all. Second, the reaffirmation of goals and values. It comes from you—from those of you who have cared enough to make suggestions for improvements; from all of you who have written and phoned; from the visits made to new campers and to returning campers; from letters and meetings with counselors and former counselors. The realization of the importance of Scatico in the lives of so many people places a heavy responsibility on all of us involved with making camp worthy of the task. We have just finished the outward voyage in time, arriving at the five months preceding the start of the camp season, and Scatico ‘74 promises to be the most exciting and rewarding of all. Challenges? Plenty of them: shortages, conflicting values, inflationary prices [remember, this was 1974]—but as long as people have to live in groups, want to gain in self-confidence, grow in skills, and appreciate the difference in others there is a need for Scatico. We’re ready, eager, and able. Join us. *Other includes Upstate New York, Michigan, North Carolina, Colorado, California, and Pennsylvania.. Welcome to the second Wha’s Happenin’? column of the 2015-16 off-season. For future issues, send along all Scatico news, non-news, and photos to info@scatico.com. Other RSSes: Bunkmates Emma Hochberg and Maya Miller played against each other in a Halloween softball tournament (photo shows Emma catching and Maya batting)... On vacation, the Segal sisters (Jamie and Sydney) met Ben Abramowitz at a hotel in Nicaragua; and 2015 CITs Rebecca Harris and Ellie Klein had their RSS moment at an airport in Florida…. A November Bat Mitzvah in New Jersey unexpectedly connected Sophie Araten and Kasey Wilner … And, one final RSS, while playing an away match for her school tennis team, Jamie Silverman spotted divisionmate Samantha Derasse…. Other news (and non-news)…. Counselors Chase Madorsky (at UCLA) and Jon Gross (at Penn State) are both working in the sports departments at their colleges’ radio stations. Chase recently interviewed former Major League baseball player Brett Saberhagen (a 2-time Cy Young award winner) and Jon will be doing play-by-play for the Men’s varsity volleyball team this spring…. At Syracuse University in November to see a basketball game, 2016 sub-senior Josh Klafter visited counselors Ryan Kenny (his division leader last summer) and Josh Stuttman. 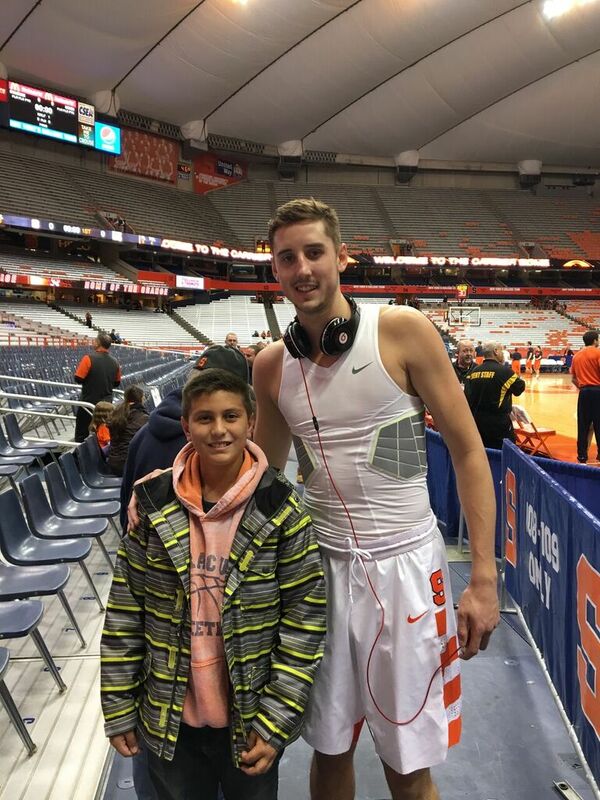 He also sent in a photo taken pregame with Syracuse player Tyler Lydon. Tyler is an Elizaville native and a cousin to Scatico caretaker Teddy Lydon…. A shout-out to siblings Andrew and Lauren Kassin, who were featured in a recent issue of “Time for Kids: Your $.” The magazine highlighted their volunteer work helping physically and mentally challenged children play sports…. Bunkmates Ellis Zuckerman and Tyler Winderman played for separate travel teams at a fall baseball tournament on Long Island. Although their clubs never matched up, they still had time for a Newsletter photo…. Definition of a perfect fall day? How about a road trip to walk around camp, with dinner at Sal’s and ice cream at Holy Cow? 2015 CITs Rebecca Harris, Izzy Rosen, Samara Edelson, and Lily Recht perfectly executed that exact game plan (sending in the picture to the left)…. On a recent trip to Madison Square Garden, Brett Bockstein made sure to take a photo of himself next to the Walk of Fame plaque of Scatico founder Nat Holman. Once inside the rotunda, you can find a photo of Nat from 1925, in his uniform (now displayed in the Admin building) as captain of the Original Celtics…. When Jane Rosenfeld’s Kenyon College acapella group performed recently in New York City, a large contingent of Scaticonians turned out for the show. 2015 Debs at Molly Rusoff’s Bat Mitzvah and then at the post-party sleepover at Sophie Stein’s house; 2015 Soph Boys at a Gaga Center. Thanks to all who returned the summer of 2015 camper surveys. Below, we share your Favorite Meals, Favorite Activities, and Favorite Specialty Activities. On each side of camp, more than 50 different activities received votes! April—Parents’ Handbook: Information to get you ready for the summer of 2016, including details on Opening, Visiting, and Closing days. Coming Soon to a Camp Near You… Building campfires and hiking along the Hudson River.